Art Effects is located in central Florida and is an hour away from Tampa and Orlando. 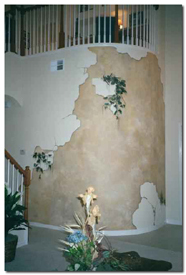 Many of our finishes and especially our murals can be shipped across the country and throughout the world. Trompe l'oeil murals, faux finishes and hand painted furniture, are painted using techniques in trompe l'oeil and the art of faux finishing by Art Effects to create illusions and decorative finishes. Welcome to our "Art Effects", where "Painting Your Imagination" is accomplished with trompe l'oeil (Trompe-l'Å“il), murals, faux finishes and hand painted furniture. what you see is not always what you get. The following is Art Effects' online examples of decorative finishes ( trompe l'oeil) and painted wall murals that tricks the eye. such as a painting applied directly to a wall or ceiling. 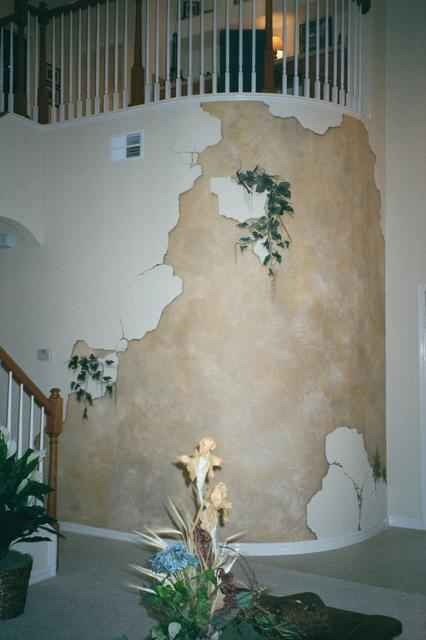 faux finishes with unique effects and other illusions with art. into all our decorative finishes. Can you tell where the faux ends and the real begins? Using skills in trompe l'oeil and faux finishing Art Effects can create imaginative children's murals or accents in your child's room to fulfill their wildest dreams. Now it is easy for you to own an Art Effects' Mural... Portable Murals Easy to place where ever you want and easy to move. An online magazine created to be the leading resource of contemporary decorative art and artisans. Sign up Today for this free online magazine! Customized to your favorite sport! The new decorating solution for your home or office these portable murals are are easy to install and move at a later date! All our decorative murals and other effects are largely influenced by our love of nature and wildlife. 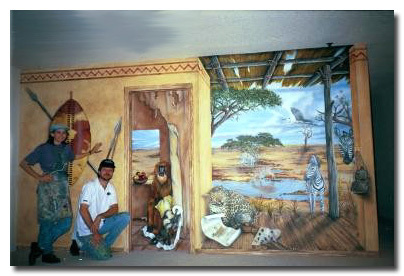 Many pages will lead you through our wall murals and unique artwork where "Painting Your Imagination" is our goal. 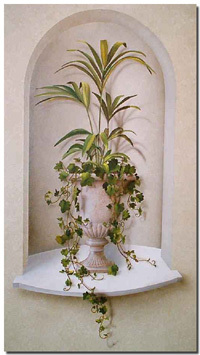 Each painted mural or decorative finish is created using carefully executed techniques in trompe l'oeil and faux finish painting, both of us, as artist love putting extra care into the trompe l'oeil aspect of the piece of art. 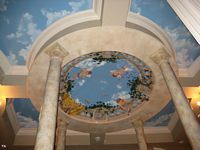 Please enjoy our "Art Effects"... decorative finishes and unique murals created using trompe l'oeil and faux finish painting techniques and check back often, we try to add to our portfolio of painted finishes as our murals and decorative finishes are completed. Using our unique Art Effects on a custom designed piece of furniture we create and hand paint in our shop or one of your own, you will be guaranteed artwork that will make a lasting impression. Follow the link below to see some examples of our hand painted furniture, we create using talents in design, faux finishing, trompe l'oeil effects and mural painting. Peintre de l'illusion Johanne Bilodeau, offre des services de peinture de faux finis, des imitations de bois, de marbres, de bÃ©ton, de murales, Trompe-l'Å“il, de fausse tapisserie et plus encore. Des finitions Ã l'ancienne sur meuble et armoire. 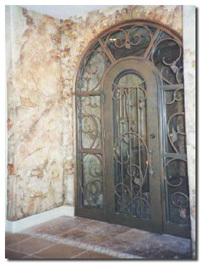 Decorative Finishes in "Concrete Stain"